The Fellowship was fortunate enough to obtain a copy of FAIRLADY #1 from Image Comics. The story is written by Brian Schirmer; with art by Claudia Balboni, colors by Marissa Louise, and lettering by David Bowman. Jenner Faulds, a veteran from the war, has come home to become a private investigator. The problem is the specially licensed private investigator is usually career for men. So she takes the jobs no one else wants. Her current case involves a missing bookkeeper and money. Finding someone who doesn’t want to be found is tough enough, it’s even worse when you are a “Fairlady” facing sexism everywhere you turn. First off: doing a “done in one” story arc is a brave choice, but very much appreciated. Brian Schirmer provides a nice little script that is evokes classic detective story-telling with intriguing characters. Claudia Balboni, Marissa Louise, and David Bowman provide some fantastic visuals; loved looking at the alien environment they created. Once you finished this 30 page(!) book, you will wish you had the next issue already. Check it out. 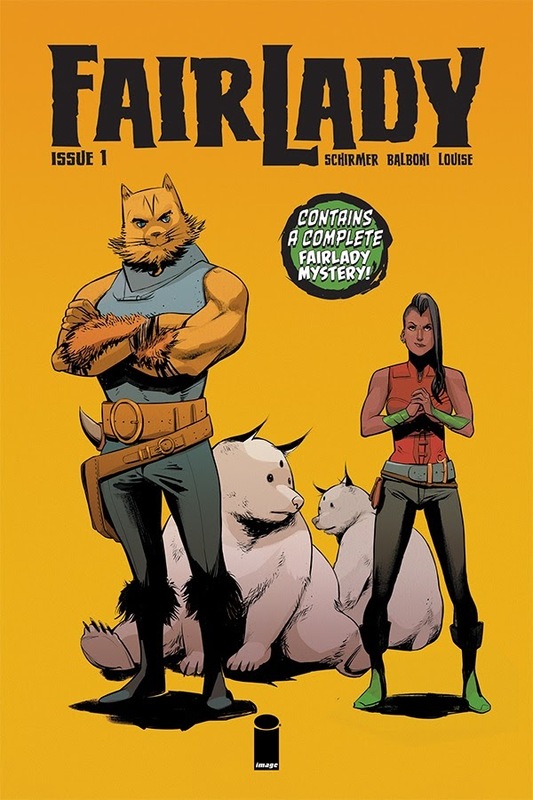 FAIRLADY #1 is in stores now or available at www.imagecomics.com.